This needs to be how society reacts to the internet-trolling dissenters that try to trash movies like the Ghostbusters reboot before they are even released. Because contrary to what these 40-year-old basement dwellers think, these movies are not for you. This is enough to make Gandhi smack a fool. But what gives me joy is not hearing what the mocking hipsters or virgins have to say, but the kids. Kids look up at the monolith and say, “Yay! Ghostbusters!” and “That looks so cool!” In their enthusiastic awes is where I see something special: The part of me—and indeed all lovers of any fandom—that still marvels at the wonder of the movies. That’s why filmmakers and studios produce these reboots and remakes: Not for the adults – who watched the originals when they came out – so that the filmmakers may be so humbled to bestow their meager creation, for the internet trolls to judge like a king watching his court jester, only to exclaim, “I am not amused! Off with his head!” On the contrary, it’s so that they can take their kids to wonder at something new and fresh, all up on the big screen. But sadly, this sense of enthusiasm has been murdered on internet comment boards and YouTube pages by hateful “fans” who want nothing but to see these flicks crash and burn—Ghostbusters being the most recent victim. Their comments are unfounded, crass, sexist, and flat-out unnecessary. Why are you judging a movie so grotesquely before you’ve even seen it? The fans can’t handle the fact that there are people who feel it’s time to grow and ensure that younger audiences share in the same love the adults feel towards a certain franchise. No, they have to be the only ones. They have to feel like they are special. There is nothing worse for a die-hard fan than to realize their favorite brand is growing. All of a sudden, their likes and interests no longer seem unique. 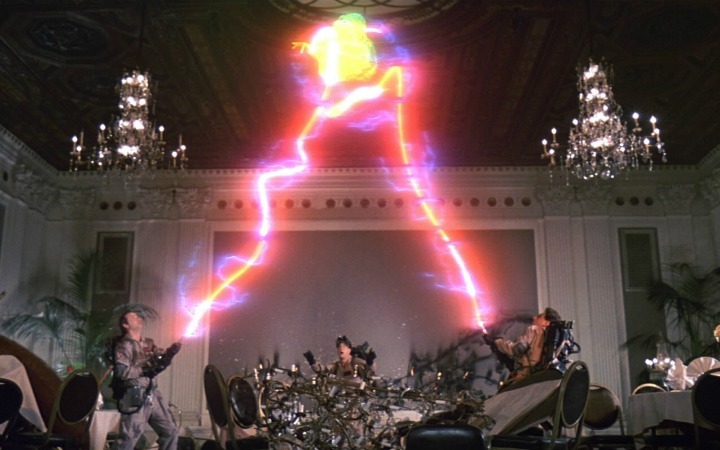 And sure, the original Ghostbusters is a classic– one I remember watching countless times on VHS as a kid. But so are Gone with the Wind and Wizard of Oz, and how many people under, say, 20, have actually seen those and appreciate them for what they are? That’s the way the world is for young people. Why would they want to watch something “old”? I don’t condone that reasoning either, mind you. Nothing makes me wanna strike a child more on their fat face when they say Indiana Jones is “old”. I could do it too, and a jury and judge would call me a hero. But that’s not the point. The point is if we want kids to appreciate the same things we do, we sometimes have to give them something different. This jogs interest in both the new version and the old. The quality of the new Ghostbusters will be decided soon, but regardless of how it turns out, what die-hard fans of the original should be grateful for is that it brings the original back into the conversation. Same goes for what Jurassic World and The Force Awakens did for their brands. Sure, Star Wars has always been massive, but these new stories have made it more popular than ever for the younger crowd. Now parents and their kids can have conversations about Star Wars, both the old and the new versions. And have we not forgotten the whole ‘what’s the deal with Kylo Ren’s lightsaber?’ issue that was driving fans crazy when the first teaser for Force Awakens dropped? But, once the movie came out it didn’t f***ing matter. Kylo Ren was awesome, the movie was awesome: now we can all be happy and have punch and pie. 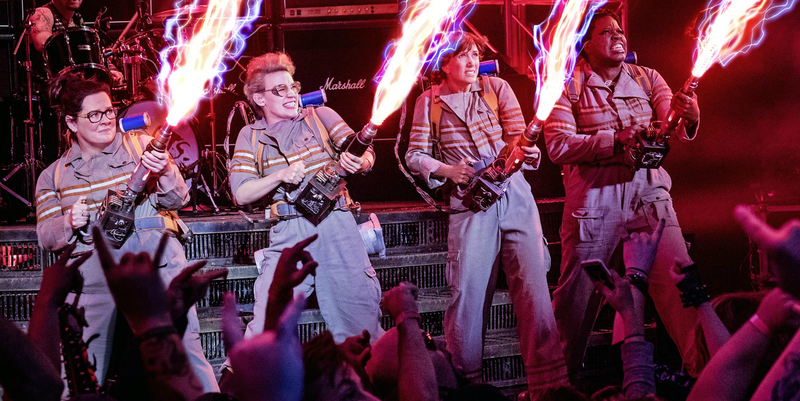 Can’t we just wait to see Ghostbusters, and hopefully be met with the same satisfaction? There is magic in this—the magic of the movies, to be precise. Sure, it’s a sign times are changing, but are they really? Remakes/boots aren’t always just quick cash grabs, but are works of passion made by people who love the originals just as much as you, wanting a new generation to as well. Dissenters are always going to miss this while the Cheetos residue on their fingers gets into the eyes. Missing this point is always something they will do the longer they complain on message boards, like tweens texting in biology class. You can’t learn anything if you don’t shut the f*** up every now and again. And, if anything, do it for the children—the sweet, doe-eyed children. This would be much more convincing if Sarah McLachlan were playing in the background.